Five Under 35 is a series of chats with young professionals in the industry who take food as seriously as us. Binge talks to both the person on the job, and the one behind it. This month: restaurateur and chef Pavan Jambagi. 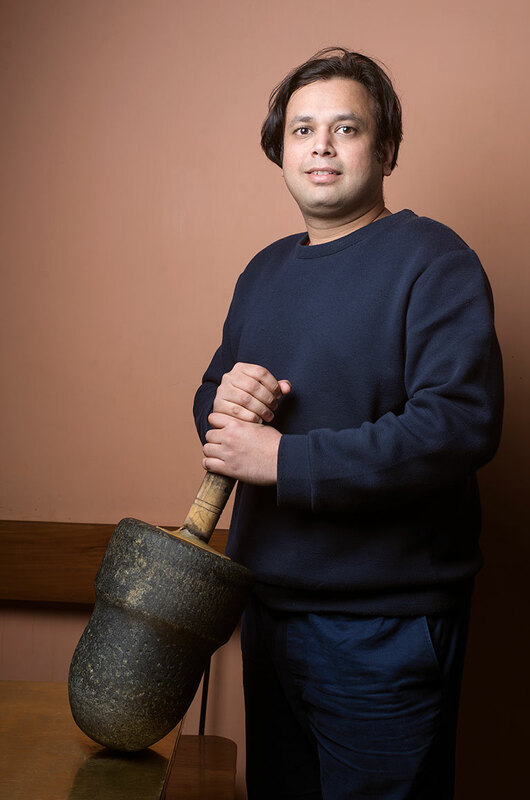 He only recently touched 35, but we thought it grossly unfair to miss out on one of the young people who gave Delhi its most original (and loved) restaurants dedicated to regional Indian cuisine. So we chased the otherwise media-shy guy, until he agreed to come out of his shell and share a little bit of himself, even if only for one conversation over filter coffee. Jambagi launched Carnatic Café in 2012 (when he was 31). The brand has been an evident mix of his Indian rootedness and global sensibilities from day one—an intricately researched menu, with food from the far reaches of Karnataka that most of Delhi had probably never tasted before, and a legitimate “café”, the kind of space that’s hard to come by among the city’s upscale dining and street food extremes. Studied at: I studied in Bangalore; I did both my undergrad and post-grad there. Then, I worked in research, which was more ethnography and anthropology. That required me to travel a lot, especially to rural parts of India—deep-dive immersions without any agenda. It's usually an investigative kind of research, but that was not the case for me. It was more about observing and then reflecting: something you don’t approach as finding an answer to a question, but rather an understanding of life. People don’t open up easily. So, if you want to understand their life, you’ve got to spend some time to go beyond the surface. It was very exciting learning about the different cultures and parts of India, including smaller towns and rural areas. Later, I wanted to study design, and so I applied for various courses in Carnegie and so on. It cost me a lot of money—about 50-60 lakhs—and finding that kind of finance was a little difficult. All the work you do, with so much empathy, becomes useless unless and until you express it to the world. It’s not enough to just understand life as it is, when people ask what you’re going to do with all this information and you don’t have an answer. That is very frustrating. There’s all this research, and you know so much, but you can’t do much about it. Especially in design, which India lacks. I’m not talking about aesthetic design, but fundamental design: be it behavioural, signage, plumbing, or electricity. I like to delve more into tangible design solutions rather than the aesthetics. Then this café happened, so it allowed me to express what I had been experiencing since childhood. It was not just a business idea, but many things coming together and an expression of them: the food that I knew and had grown up eating, which I know well as home food. That’s how I became excited about it. You don’t find the kind of food that we serve easily; our food has not travelled, because there are no entrepreneurs in my community or culture in the food business. Tamil, Keralan and Andhra food, on the other hand, has travelled a lot, because those areas have a lot of entrepreneurs from the industry. You’ll find more of that food across India, and abroad as well. Their food has travelled a lot more that Brahmin Karnataka food. Was it easy to introduce Carnatic cuisine to Delhi? Carnatic Café was a very novel thing for people because before that, South Indian food had always been the Tamilian version of South Indian food. People know about Kerala because of tourism, and you’ll find more Tamilian restaurants in Delhi. The old Mysore / Bangalore food has not travelled that much. So, that was a big change for people. “How can dosa be so fluffy and thick?” Otherwise, it’s always this thin, crisp dosa, which was the notion for many people, and that completely changed. At home, we never have the completely crisp, paper-like dosa; it’s always fluffy, with butter and ghee. It’s an everyday home-breakfast. Obviously, mothers use a lot of butter and ghee in the food, and that’s why I never enjoyed having South Indian food in Delhi because I never found that here. I've never had home-cooked old Bangalore / Mysore food beyond Bangalore and Mysore. I think that was a big change for South Indian cuisine in Delhi. The good thing is that some things are classics, and you shouldn’t go wrong with what you already know. If I’m cooking a simple coconut chutney, it has to be the best. And you put in the same amount of dedication, energy and time that is required for the process. That is something which we’ve done since the beginning. That’s what the people started to like because we were doing simple things to the best of our abilities. That’s why we get a lot of repeats. You can’t go wrong with classics. What are some of the challenges that come with being a chef in Delhi? There are two basic problems. The first is being able to find vegetables of a certain quality everyday. It's important to find out what vegetable works with what dish—there are ten different types of potatoes, and each potato goes with a different dish. This isn't only a problem in Delhi, but everywhere. The second is that the local markets are not stocked well enough. A new entrepreneur cannot go to these shops in malls and make huge investments there; they can't go to the local markets either because of bad hygiene and low maintenance. A start up won't be able to afford high-end vegetables. One chef who is doing well at the moment: I like Noah (Barnes). He runs Arriba and The Hungry Monkey. I find him very intelligent and he's very passionate about ingredients. I love chatting with him about ingredients, and the nature of the ingredient and sourcing. I find him to be dedicated and focused in terms of the amount of energy he spends on sourcing ingredients. One food trend that’s going to stick around: I think all the classics from each region of India, provided they are done well. There might be some interpretations of that, but if I’m eating a dosa, I’d like it to taste like a dosa and not anything else. Keeping it basic, but using the best ingredients. I don’t know about “trends”, though; it’s very tricky. I believe that you have to do justice to the expectations of a customer. If they want good chhola-bhatura, it has to be good chhola-bhatura and nothing else. It has to have good quality ghee; it has to have the best oil. You can’t go wrong. It has to be made right. Simple things and making them with the best ingredients is something which will never go out of fashion in food. I think anybody who is in this business should be doing this and nothing else: focus on the food, and it will be a trend forever. Cooking philosophy: Keeping things balanced; not making anything too extreme. Not using any extreme flavours: not too sour, not too spicy, not too sweet. No extreme textures, either. Water is very important; one glass of extra water will spoil the dish, and one glass less will spoil the dish too. Favourite food: I love Mexican and Gujarati food. With Gujarati food, everything can be made in so many different ways. It’s really amazing: if you want to make one dish, it can be interpreted in 15 ways and they’ll all be good. The snacks in Gujarat are amazing. Favourite drink: I don’t drink but I love nimbu paani, with just lemon, cold water and a little bit of salt and sugar. Favourite restaurant in Delhi: This will put me in trouble. I visit Diva in GK-II a lot. I love their food. Favourite restaurant across the world: Chipotle. Likes to binge on: Mexican food. I love avocado dips. Also, chaat: sev puri, and Gujarati chaat and snacks. I look forward to these when I'm catering.